Our northernmost pineapple plantation near Humpty Doo, south of Darwin, in the Northern Territory is Australia’s most remote commercial pineapple farm. Our Darwin farm – set within a vast banana plantation spanning more than 400 hectares – produces Piñata pineapples for some nine months of the year. Our Darwin farm is three days’ drive by triple road train from interstate supermarkets in Adelaide, Perth and Melbourne and an hour’s drive from the nearest market in Darwin. This tropical region experiences two distinct seasons – the wet and the dry. Piñata pineapples, usually associated with the Sunshine Coast’s more forgiving sub-tropical climate, flourish here. 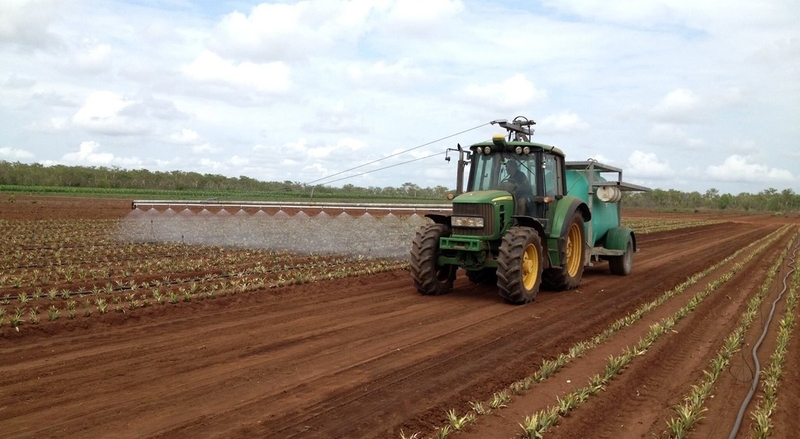 Our Darwin farm has some 3.1 million pineapple plants cultivated on 50 hectares. Our first crop was harvested in 2015. This region's production starts in November and ends about August. Bed preparation is vital in dealing with the wet between November and March. An average of 1,600mm of rain can fall in this period with more than 1,000mm usually falling in January and February. As pineapple plants prefer dry feet, blocks are levelled, beds are raised for drainage and paddock holes are filled so water can run off. Winters, which rarely dip below 14.9 degrees celsius at night, reduce stress on the plants – resulting in more uniform fruit. Top End pineapples are picked in the cool of the morning, packed on-site and transported to local and interstate customers, arriving within three days of harvest. Along with our joint venture partner, LaManna Premier Group, we also produce Cavendish bananas for Darwin Fruit Farm on this plantation.